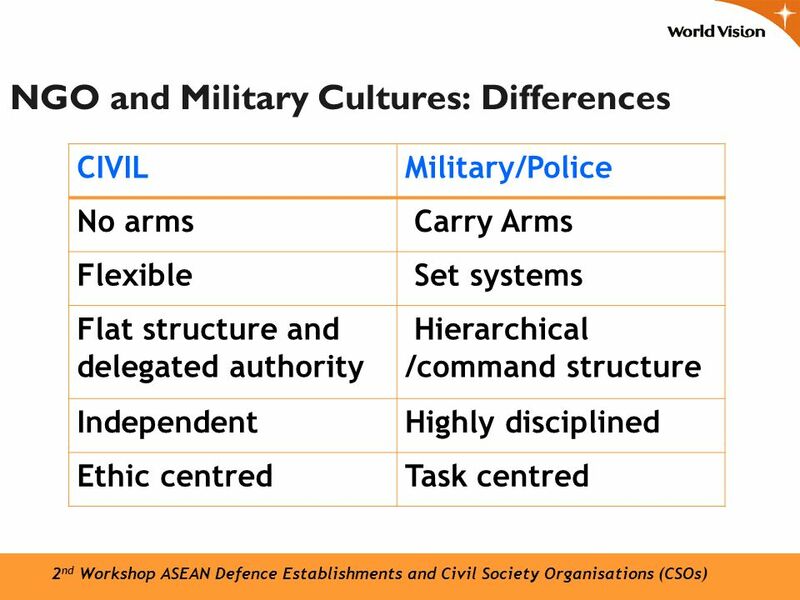 Civil-Military and Police Engagement 2 nd Workshop ASEAN Defence Establishments and Civil Society Organisations (CSOs) World Vision International © 2009. 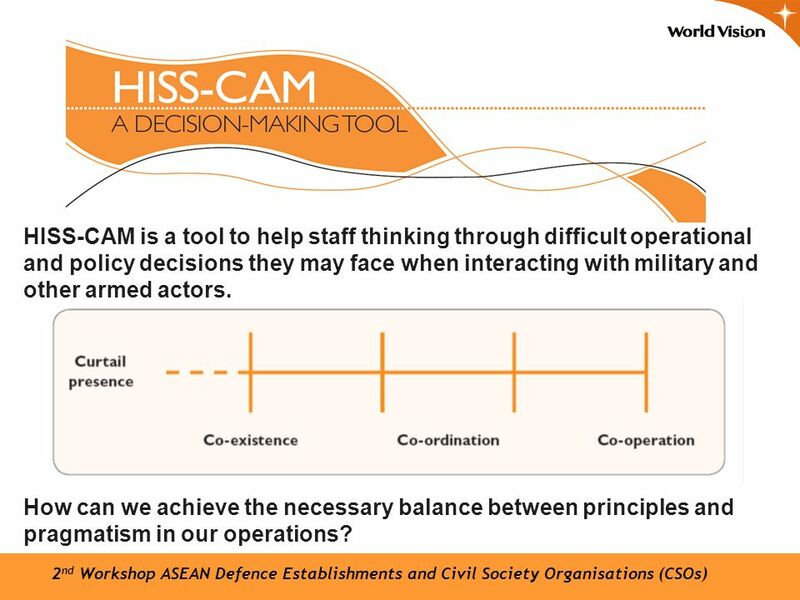 16 HISS-CAM is a tool to help staff thinking through difficult operational and policy decisions they may face when interacting with military and other armed actors. 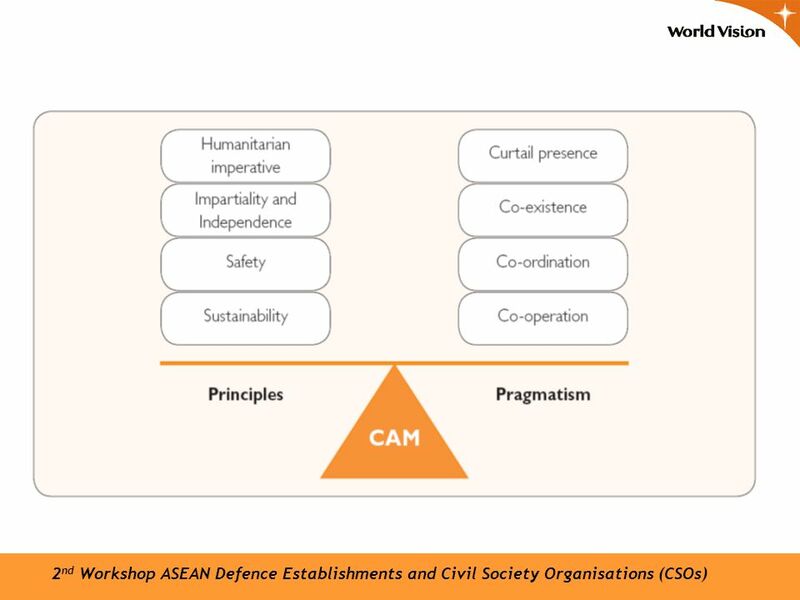 How can we achieve the necessary balance between principles and pragmatism in our operations? 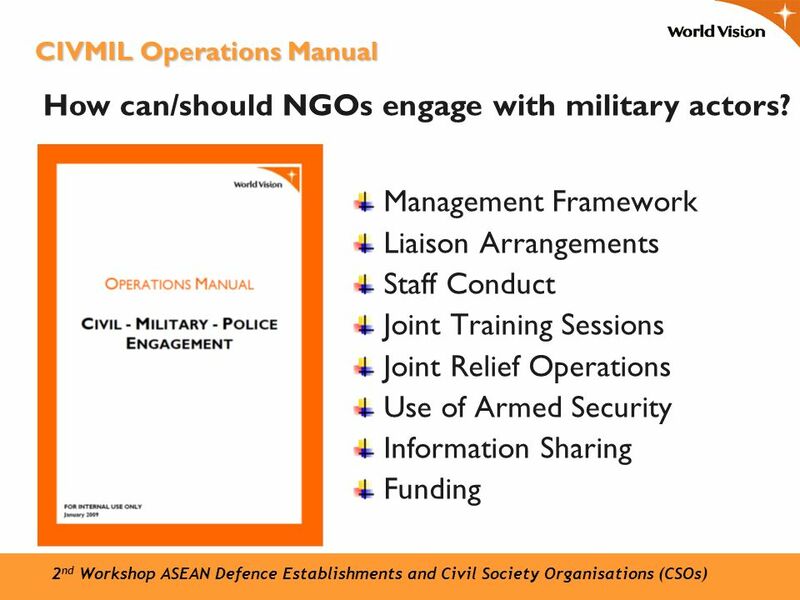 Download ppt "Civil-Military and Police Engagement 2 nd Workshop ASEAN Defence Establishments and Civil Society Organisations (CSOs) World Vision International © 2009." 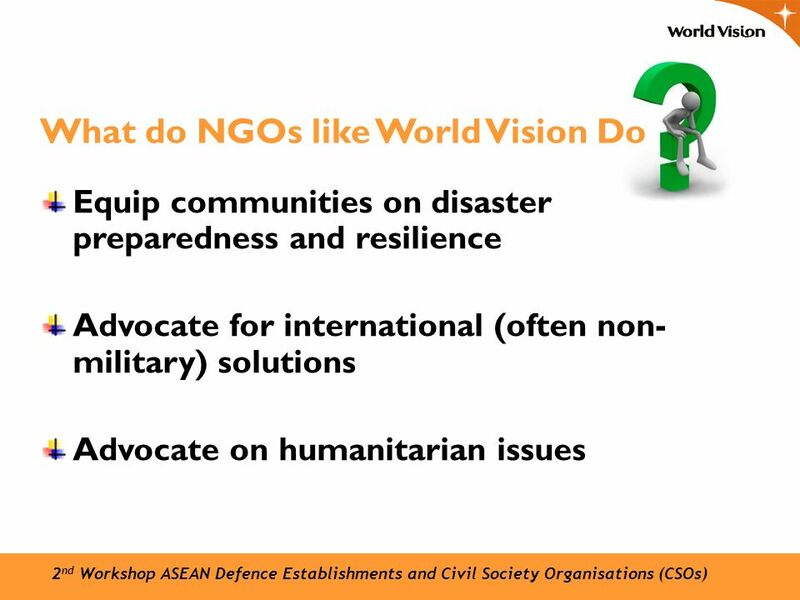 Session 2.3 Applying the INEE Minimum Standards: Emergency assessment and design to BUILD BACK BETTER. 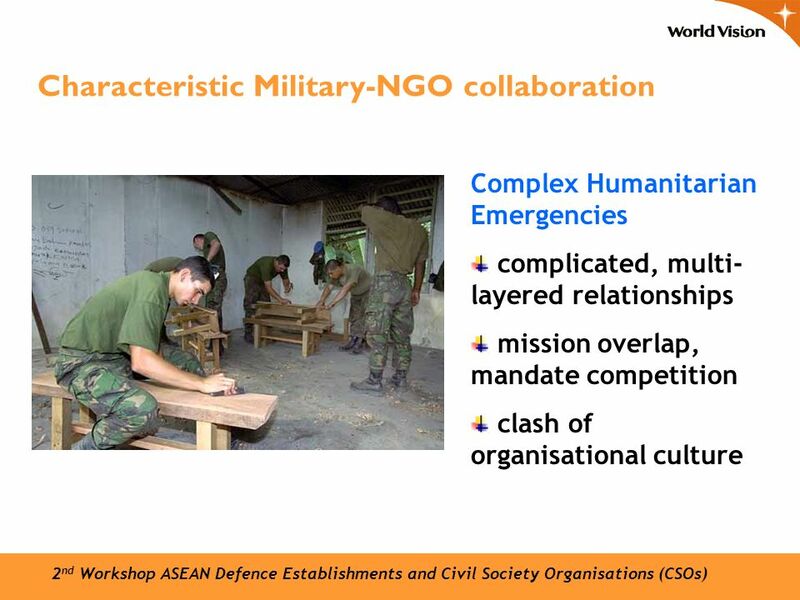 Group 3: One Mission Two Languages – Coordination & Communication Gaps between Military and CSOs. 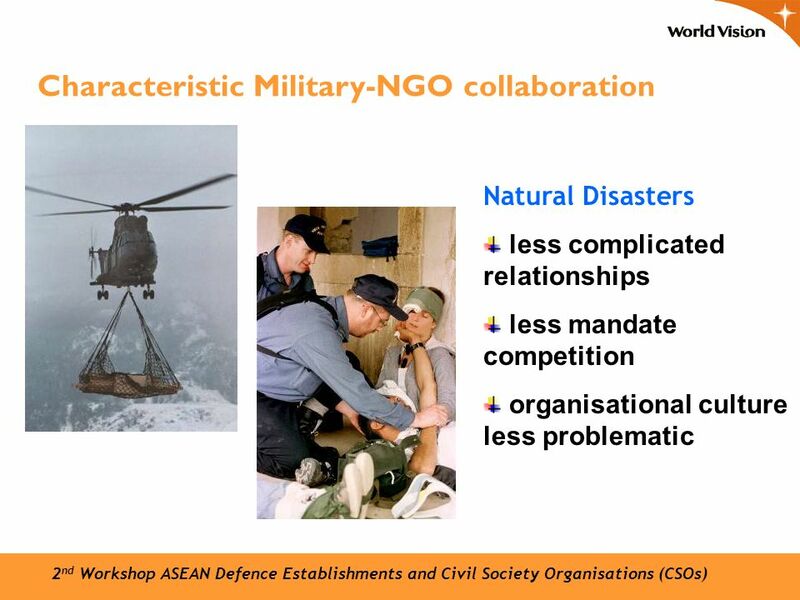 Thailand Disaster Management Structure and Links to the ASEAN Agreement on Disaster Management and Emergency Response and Beyond ASEAN DEFENCE ESTABLISHMENTS. 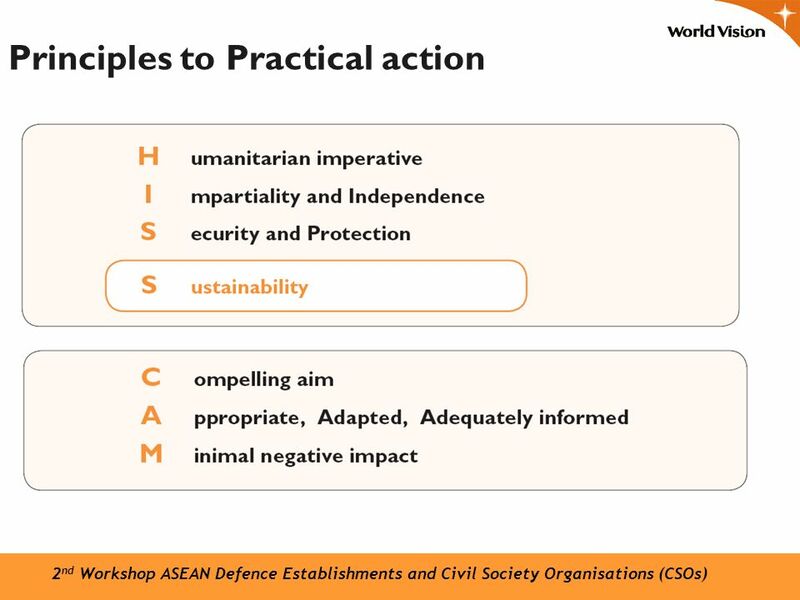 SESSION 4: HUMANITARIAN PRINCIPLES. 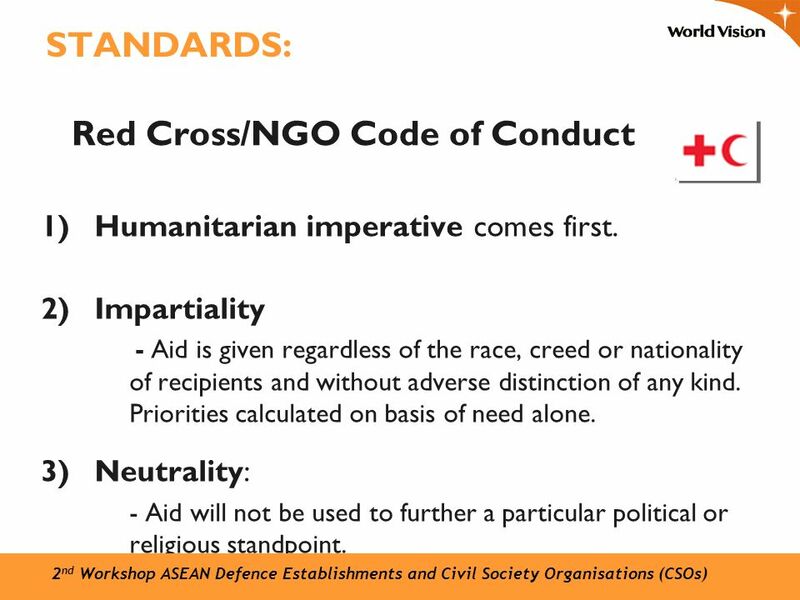 AT THE END OF SESSION 4, YOU SHOULD BE FAMILIAR WITH: 7 humanitarian principles used by UNICEF and how to apply them. 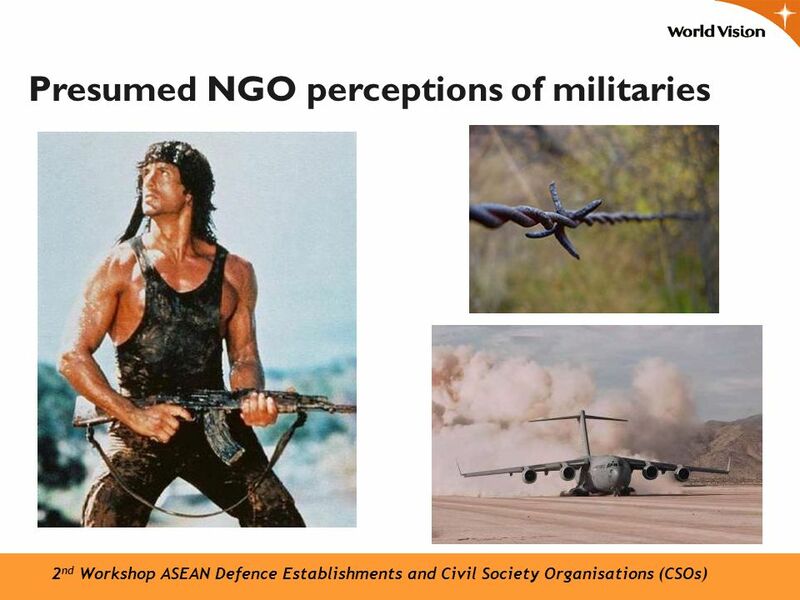 The European Commission Humanitarian Aid department DG ECHO European solidarity with the worlds most vulnerable people. 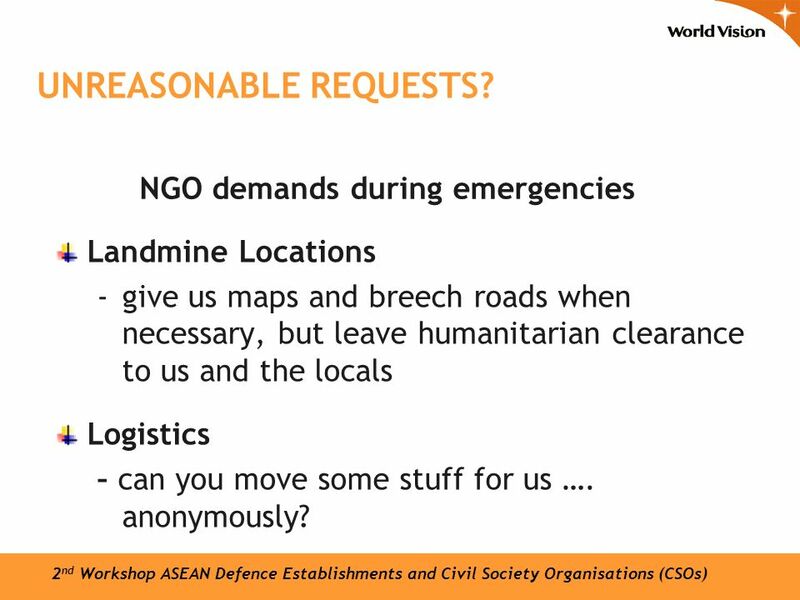 Session 4 Responding to an Emergency. 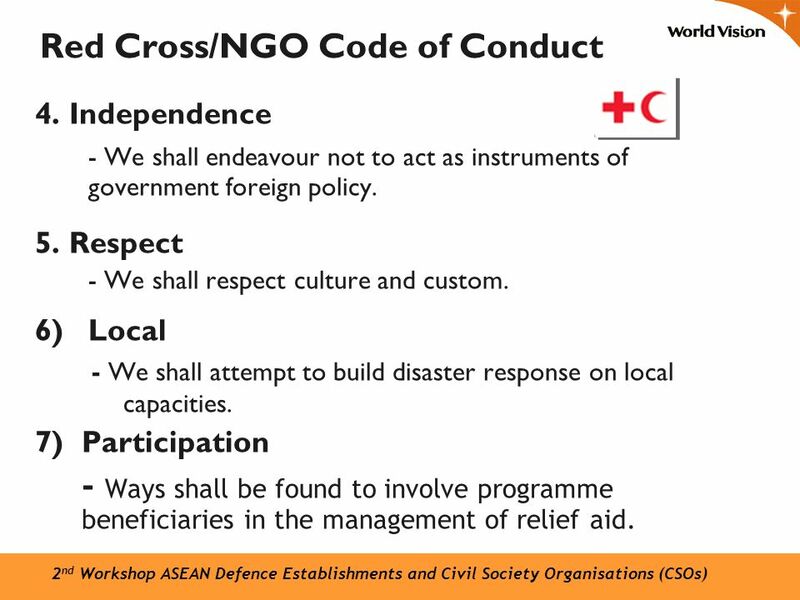 Objectives At the end of this session, you will: Be familiar with the RC/HC Handbook and the Emergency Checklist. 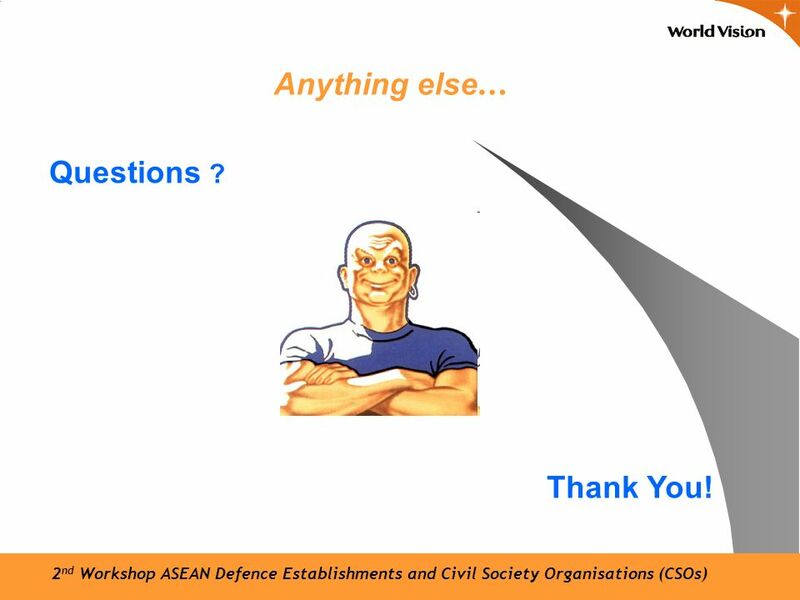 Wednesday 1 December 2010Shelter Partners Forum is hosted by CAGI and supported by Habitat for Humanity Shelter Partners Forum Wednesday 1 st December. 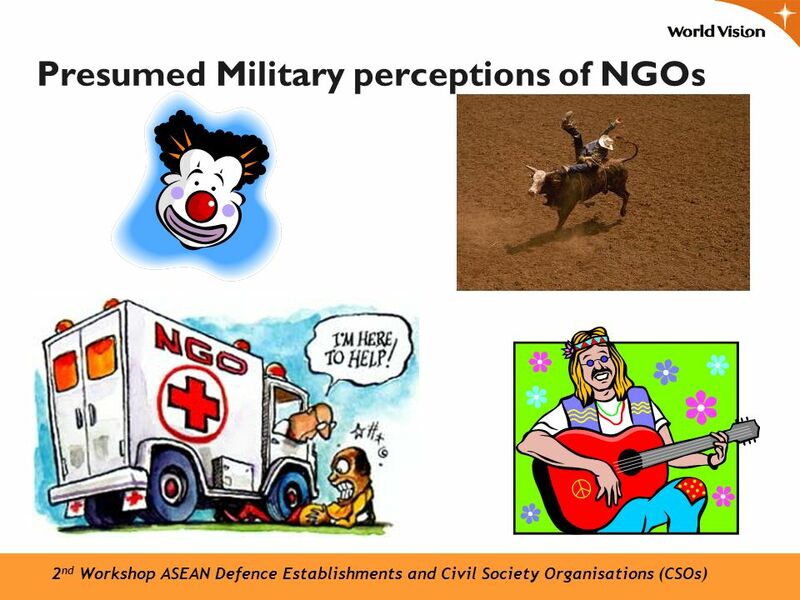 Civil-Military relations from an NGO perspective Andrea Schneiker 30. Juni 2011, Münster. 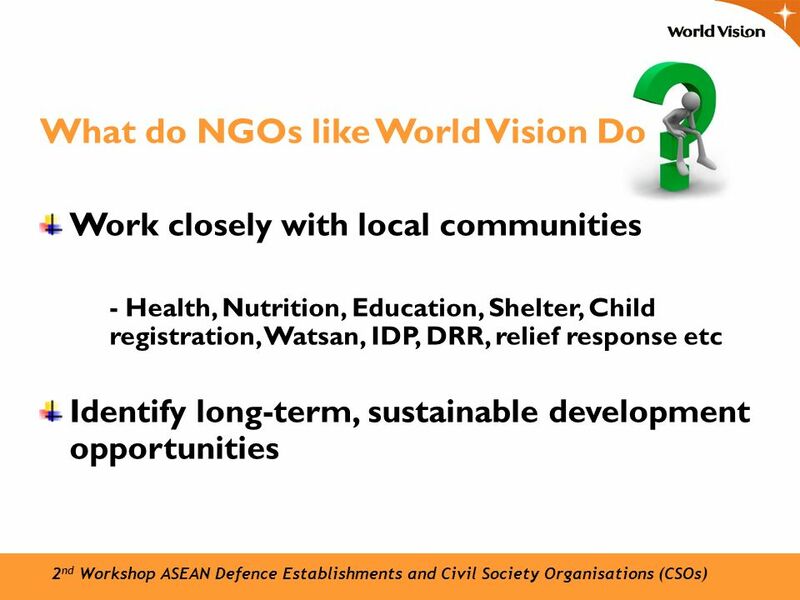 1 NON-GOVERNMENTAL ORGANIZATIONS AND PEACE OPERATIONS. 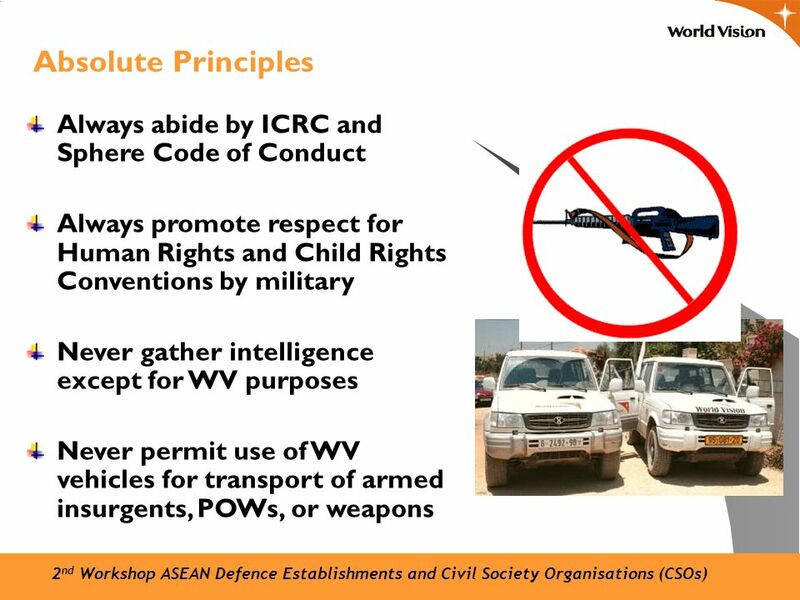 Principles that guide humanitarian work. 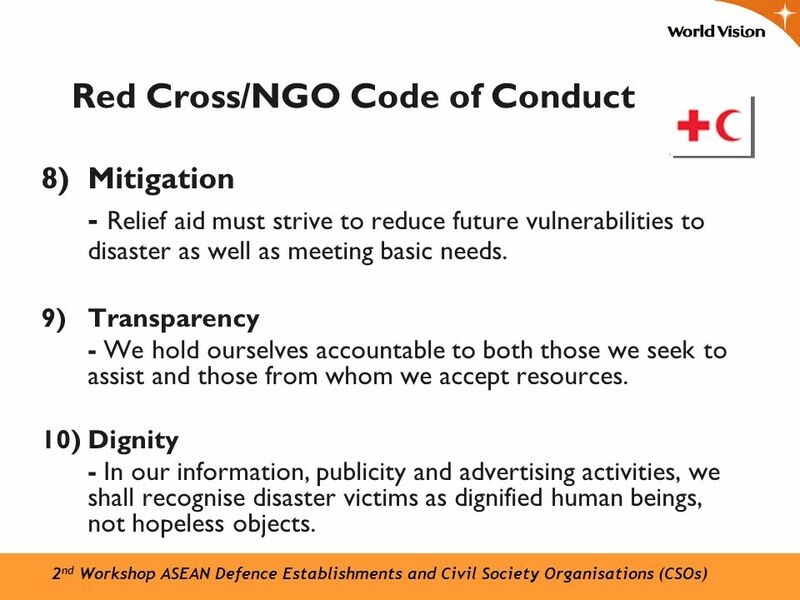 Humanity Human suffering must be addressed wherever it is found. 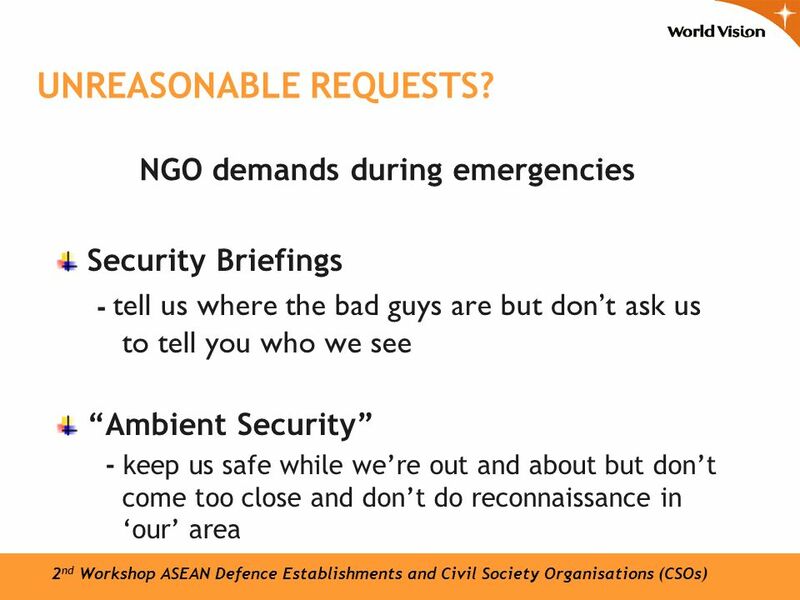 Particular attention to the most vulnerable. 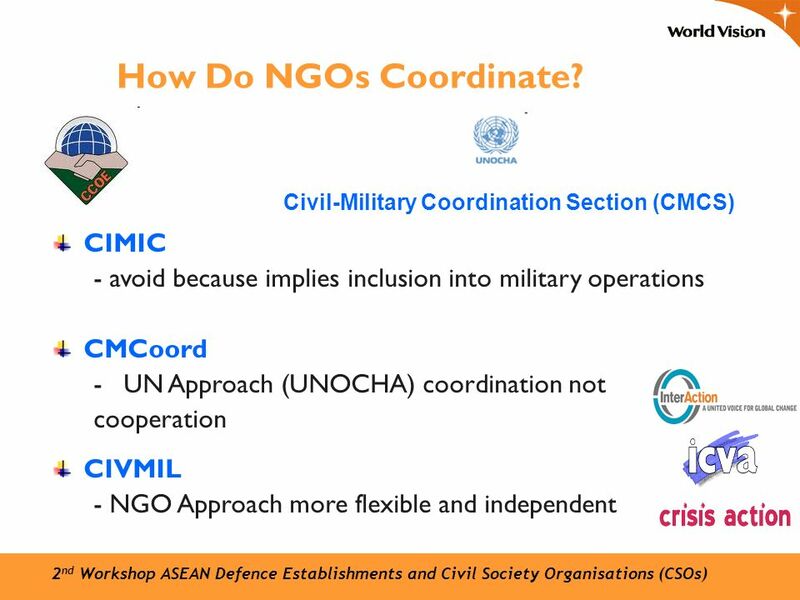 Evaluation of OCHA’s Role in Humanitarian Civil-Military Coordination Findings and Recommendations Seminar on Evaluation of UN Support for Conflict Affected. 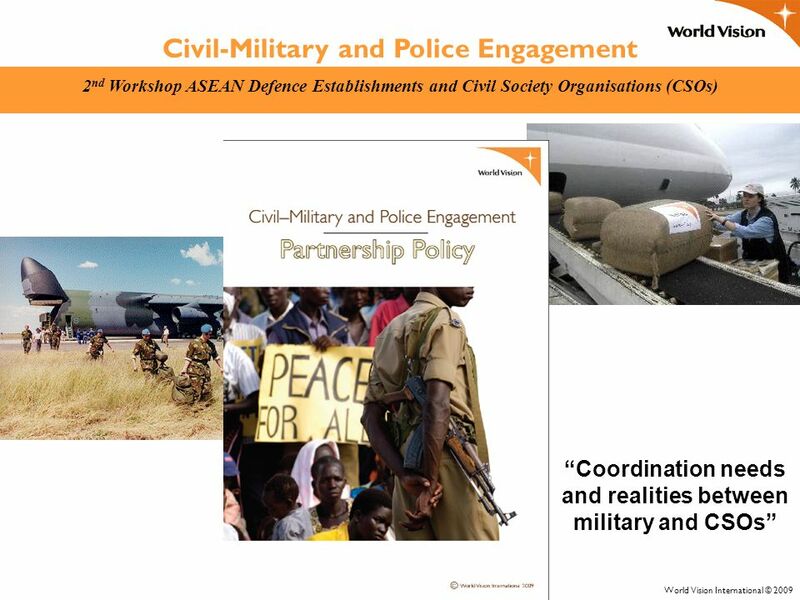 Civil – Military Cooperation (CIMIC) Challenges & Opportunities: Some pointers for reflection August 2005.